Mark Manson is an author and entrepreneur who posts on his website hundreds of articles about psychology and modern culture. ”˜Love is Not Enough’ is a straightforward look at love through Mark Manson’s eyes. 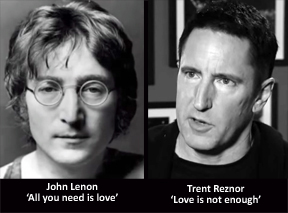 Manson compares John Lennon’s notion that “all you need is love” with Nine Inch Nails’ Trent Reznor’s idea that “love is not enough.” Manson sides with Reznor and warns that there are three harsh truths about love: love does not equal compatibility, love does not solve your relationship problems, and love is not always worth sacrificing yourself. Manson summarizes that love is a wonderful experience. It’s one of the greatest experiences life has to offer. And it is something everyone should aspire to feel and enjoy. This is a really, really insightful article. I thank Mary Ann Glynn, LCSW, for suggesting it. i would say these relationships are not love. they are lust or about abuse; one person abusing and the other person being the supply. love doesnt look like this. re: the part about would u let ur friend, let alone ur BEST friend, treat u like ur Type B lover? it takes alot of strength to be with NOOOOO friends or family (if necessary) once you’ve lost ur lover too and possibly ur life has been destroyed too. i have had to let go of most of the very small amount of friends i had left after the spath tore my life apart into shreds. its almost as if the ones left were only left becuz i was their supply. in fact, im sure of it. the normal ppl were horrified and got away. think about it. after reasoning with the victim and assisting attempts at leaving (maybe over and over) did not work, wouldnt u distance urself so as to escape the heat when the victims life burst into flames? this is how normal ppl act.